The 'Now Or Never' singer has begun warming up for her big summer jaunt and we've rounded up all the details. Halsey returned to the stage earlier this week with her first performance in almost half a year at End Fest in Sacramento on May 14th. The festival performance gave fans a real treat with stunning visuals, new songs and some snazzy pyro thrown in to boot. The shows kick off in September in Uncansville CT, wrapping up the US leg in Cleveland OH in November. Europe and other territories are expected to follow in early 2018. 2) Who else is playing? The always enjoyable Partynextdoor and Charli XCX will be coming along for the ride, basically making this the dreamy alt dance-pop tour of your dreams. In keeping with the Romeo and Juliet inspired theme of the album, the stage will be split into two sides representing the two opposing families. 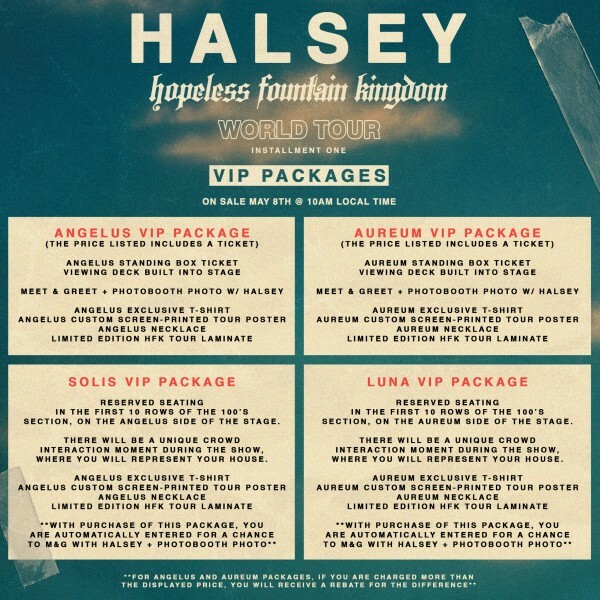 Alongside the more standard packages, featuring meet and greet and some exclusive merch, you can also pick your side via the Solis and Luna VIP packages with an "interaction moment during the show, where you will represent your house". Exciting! ANGELUS & AUREUM VIPs are $450.00 (USD) and INCLUDE a ticket in the $450 (USD) price. SOLIS & LUNA VIPs are $150.00 (USD) + Ticket Face Value. The ticket price is ON TOP of the $150.00 (USD) price. 4) Any more details atm? Halsey is keeping everything pretty top secret but she did release the above TV commercial during her recent performance on The Tonight Show With Jimmy Fallon that should give a bit of an indication of the Baz Luhrmann inspired aesthetic she's aiming for throughout the campaign. Also, that music you can hear is a clip from the upcoming track 'Walls Could Talk". 5) Where can I get tickets? 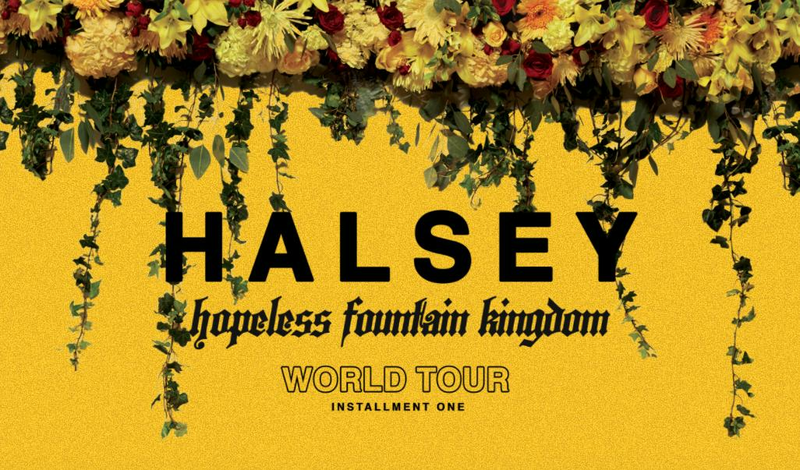 Head over to hfktour.com now for a full list of dates and ticket packages available in your hometown.